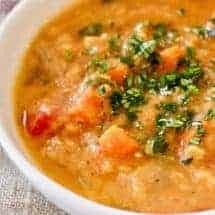 Hearty Vegan Creamy Red Lentil Soup is not just good, it’s also good for you, and very easy to make in your pressure cooker or Instant Pot. Oh no, I didn’t mistype that. Two Hundred recipes, y’all, in one cookbook! 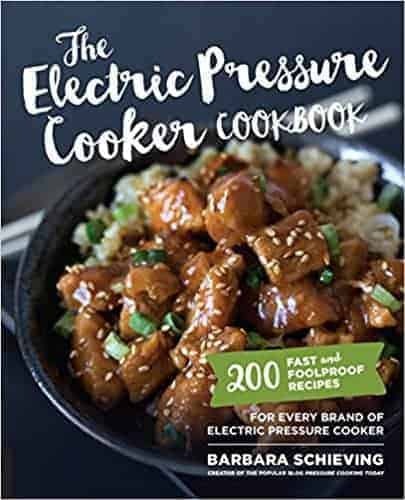 In addition to the recipes—more about those in a minute—it’s also got a pretty detailed section on Getting to know your pressure cooker that I think most people would find quite helpful, especially as she covers a variety of different brands of pressure cookers in this section. This section is full of pressure cooker terminology, pointers, and charts, as well as a Troubleshooting Guide that I think, should be required reading for every new pressure cooker owner. But let’s talk about the recipes. They run the gamut from breakfasts through to soups, dinners, sides, and desserts, and all of them look clearly detailed, easy to make, and very family friendly. As I was leafing through it, I saw a red lentil soup that looked just like what you guys might love so I decided to make it—especially because some of you have been going crazy shopping at Indian Grocery stores lately from what you tell me, and you need to start enjoying that dal! What I like about this easy, vegan recipe is that I can see how it might form a great base for several variations, such as adding in garam masala for an Indian version, or Thai red curry and some coconut milk for a Thai version, or cooking with a little chicken for a Parsi dhansak like dish—I’m sure you guys will have your own variations, all of which I’d love to hear about. So let’s get to the recipe—and do check out the cookbook for lots of other great recipes as well. Here are some of my other Pressure cooker lentil recipes. I also have a video on how to pressure cook lentils and beans, and you can download a PDF for free that tells you about different types of beans, lentils, and dals. 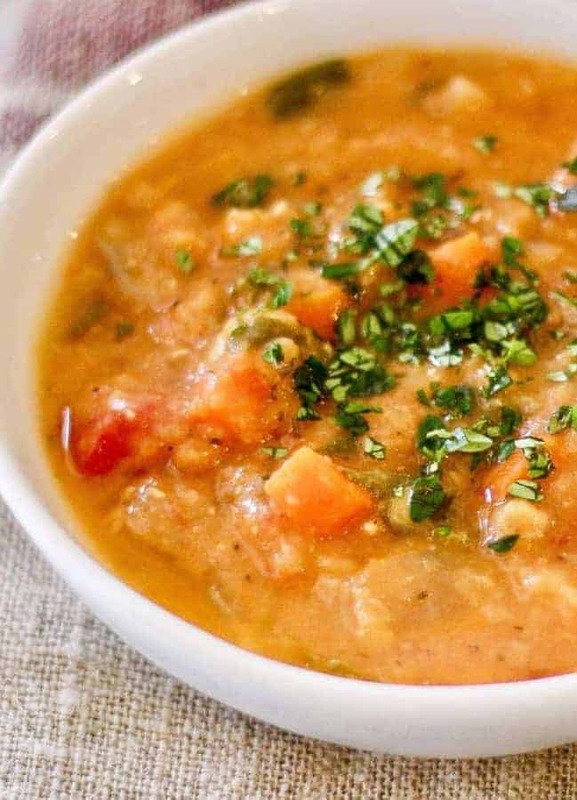 Hearty Vegan Creamy Lentil soup is not just good, it's also good for you, and very easy to make in your pressure cooker or Instant Pot. I absolutely love this recipe! It’s so flavorful and healthy. Thank you so much for sharing! Very good recipe! Made a couple of changes by necessity and laziness: Only used water for liquid and reduced it by 2 cups. Used immersion blender right in pot but left some unblended (saved washing up.) I agree that this recipe is very flexible! it was really good. The fire roasted tomatoes gave this soup a distinct flavor. its just that the brand I used had a roasted skin on so the soup had some black little particles in it. Maybe I should use some other brand of roasted tomatoes for guests. Amazing. I did an Indian twist on my soup & added garam masala. At the end, I swirled in about 1 cup of coconut milk before serving. My husband ate 4 bowls! Coconut milk, that sounds great! I too did the Indian angle, mustard and cumin seeds, hing, turmeric, chili powder, cumin, coriander, garam masala. Then I added 1.5c of steamed frozen vegetables. It’s a meal!! I made this tonight and it was fantastic. I used kale instead of spinach because that’s what I had, and it worked perfectly. Will definitely make this again. How many cups are in the serving size? Very easy and tasty, the hardest part was finding the red lentils. Finally found them in the natural food isle, not with the other beans! This was so good! My hubby isn’t a lentil fan, but making them in the pressure cooker where they just fall apart and make the soup creamy is the way to go! I also added some brown rice to it and it was awesome (cooked for 12 min vs 10). Didn’t have tomatoes so skipped those, otherwise the same! Definitely making again! I love all your ideas for changing up the soup. Thanks so much for making a recipe from my new cookbook and sharing it on Two Sleevers! So glad you like the book. Can I use green lentils – I thought I had red but I don’t…. 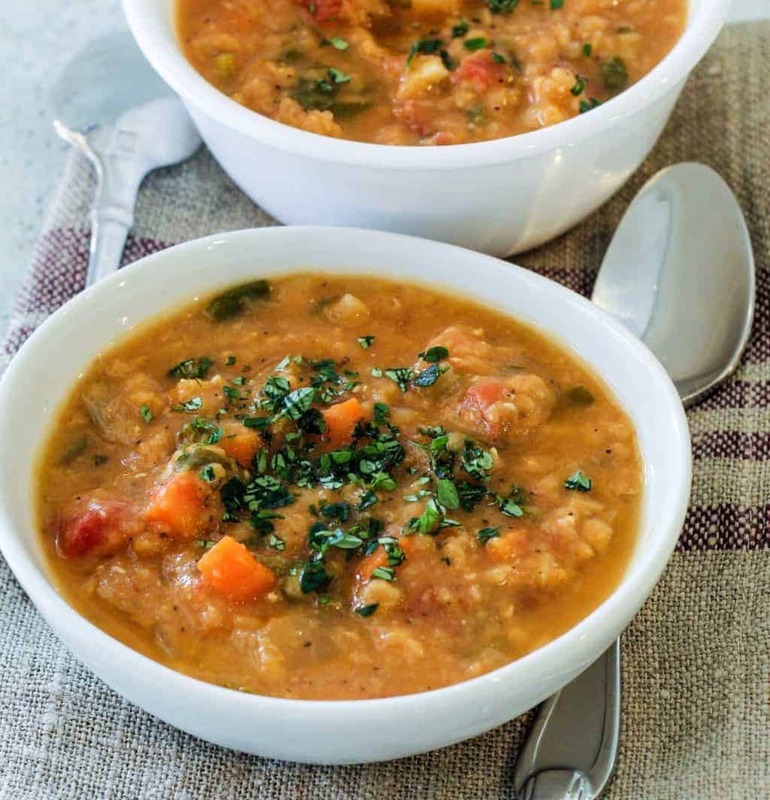 I am thinking yes just different look to the soup – I DO have split red lentils… maybe use both? I think cook times will likely be longer for green lentils than for red, it may take a little experimenting.